Meet inbound marketing. This is where social media tools, content and your evolving online presence can help to generate traffic and build an online community of followers through your website, organic searches, social media and referrals. Think blogs, tweets and SEO. Meet outbound marketing. This is when prospecting, lead generation and lead nurturing is largely achieved through direct marketing tactics with a contact list that is targeted based on industry, geography and market size. Think emails, telemarketing and direct mail. What was once viewed as two opposing sides of the marketing coin is fast becoming an interconnected machine. Today, there are many ways in which inbound marketing and outbound marketing feed off of each other. For instance, a lead can arrive from either inbound or outbound streams. However, how a lead is progressed can vary within the overarching marketing tactics. In that regard, lead nurture and progression stages are where the inbound and outbound universes collide. Here is an inbound meets outbound scenario. Say your outbound strategy is to send an email to a list of contacts to promote registration for an event. The email includes links to your website for the registration form as well as a case study that can be downloaded from your website. If the responder takes the extra step and downloads the case study, that action could trigger further consumption of content from your website. On the lead nurture and progression side, the information gained about the prospect that filled out the form would be helpful for future contact regarding specific solutions or services that your business could offer. In that sense, there are also some critical differences in what types of prospects arrive at your doorstep through inbound and outbound channels. In the case of inbound marketing, prospects are either actively looking for you—through social media, SEO or referrals—or they happen to find you through other connections. Outbound involves more active engagement, as you put yourself in front of your target audience. Optify has provided a visual representation of how outbound and inbound marketing differ yet also share similarities in the sales cycle. Ultimately, it requires seamless integration between both marketing strategies to maximize your visibility and impact on the marketplace. 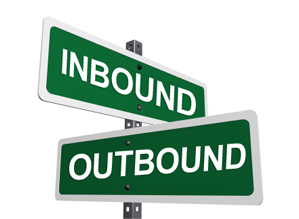 How are you using outbound and inbound marketing practices? Give us your feedback below!